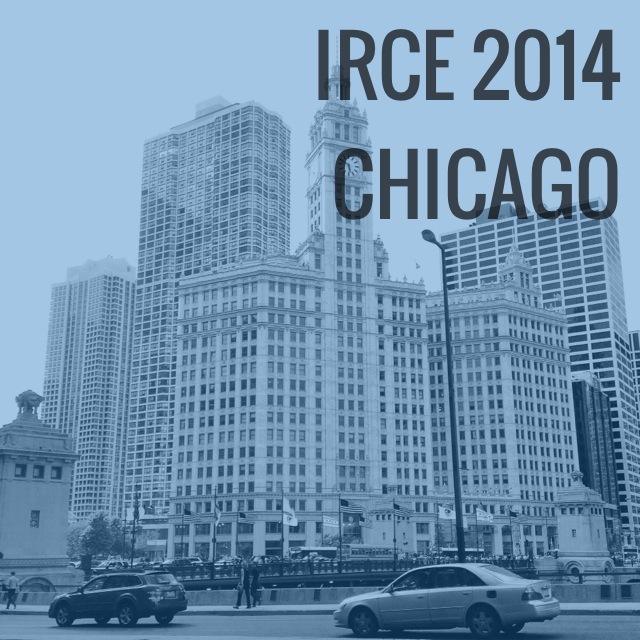 At IRCE Chicago this year, Instagram was touted as a great space (if it makes sense for your audience) by several e-commerce brands including Bucketfeet and Chubbies. I’ve been a big fan of Instagram for ages, for both personal use and for use as a brand. While it provides some frustration points for brand account managers, such as the lack of clickable links and the inability to easily access multiple accounts on a single log in, the benefits far outweigh the negatives if you are able to reach your customer base and target audience on the platform. In other words, by being steadfast the platform has done a great job limiting brand creep into its space, allowing it to maintain a greater level of authenticity. Still, for those who do not mind the labor involved, it can be a rewarding spot for brands with a keen eye. Especially now that they have added additional editing tools that give you the ability to manipulate contrast, brightness, warmth, saturation, shadows and more! Studio Design App for iPhone is perfect for enhancing curated content or easily developing quick content on your own from your iPhone. It’s also great for light image manipulation. Among my favorites is using the shapes tool to flood the image and adjust the opacity. Using a white shape, this gives you a true opaque look. Using a color over a black-and-white image gives you a duo-tone Blue Note effect. The latest version of Studio has even more options with an assortment of “packs” you can download far beyond the standard elements I found so intriguing when I first discovered the app. I am only beginning to scratch the surface here. There are other similar apps like Phonto, but I haven’t found them to have near the editing and creative abilities as found with Studio. Currently, Instagram does not allow you to post an image that is not square. Enter InstaSize; this is what I use to post full-size pictures. 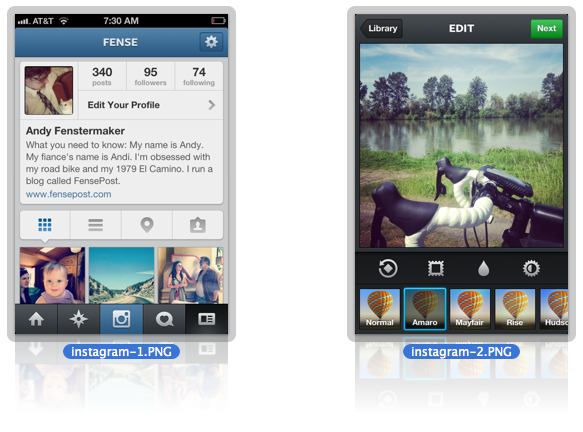 InstaSize does this by adding white space to the sizes of portrait shots and to the top and bottom of landscape shots. Repost is the mandatory app to share user generated content. It allows you to easily repost photos others have shared on Instagram. While I have not used it yet, I will be doing so in the next week. One brand that continually does this is Folk Magazine (the brand behind liveauthentic.us). 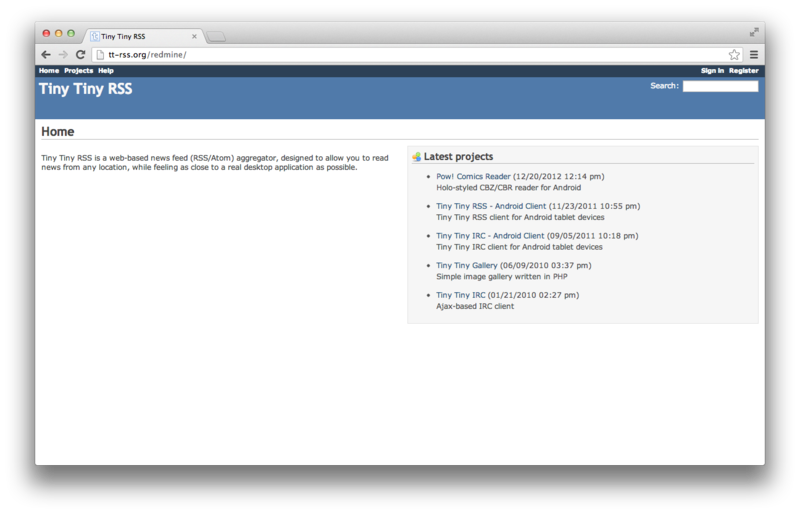 PickFlow is relatively new to me. I grabbed this one at IRCE after it was recommended from my Repost app. It allows you to create a quick slideshow of images then add music. You can include transitions if you like that sort of thing. It reminded me of something I saw from Martha Stewart on Instagram for National Donut Day. While I suspect that Martha Stewart’s creative folks put this together using something much more sophisticated, you could do it using an app like PicFlow if you’re good. If you plan to add music and use this as a brand, make sure you get permission from the artist. Those are my four picks. Follow me on Instagram, and if you have some favorite apps of your own, let me know in the comments! 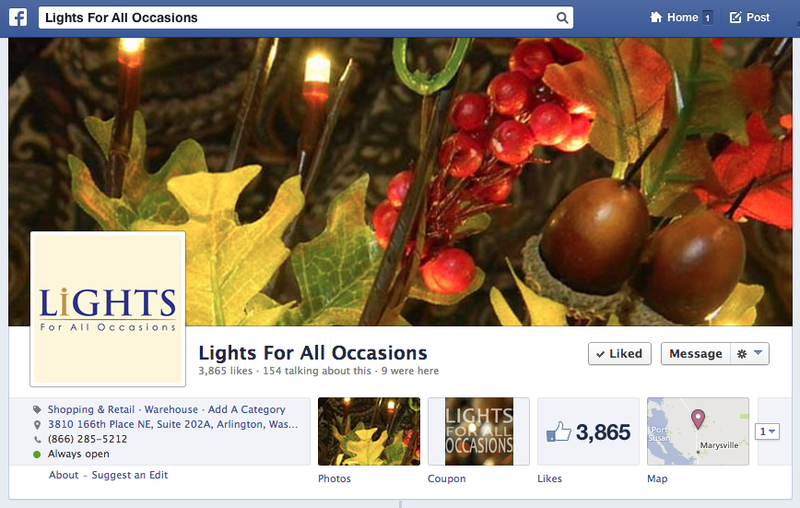 Is Your Competition Buying Its Likes? The other day, I stumbled upon a little-known trick that can help Facebook Page admins analyze how they are doing in comparison to their competition. It’s all about how many people Like your page and your competition’s page, and analyzing that data as a performance benchmark. But first, a quick disclaimer: I have yet to delve into Facebook’s “Pages to Watch” section as paranoia gets the better of me. Too many questions go unanswered — could Facebook one day inform Page admins of who is watching their page as encouragement to lure them into watching others? Given Facebook’s past with privacy, I’m continuing to hold off in those regards. 1. Your Most Popular Week: The week when most people were talking about your Page. This includes any of that ever popular “reach” data and includes new Likes. 2. Most Popular City: The city where most people are talking about this Page. 3. Most Popular Age Group: Age demographic information on people talking about the Page. 4. Most Visited Week: The week during which the highest number of people checked in at that location. Now here’s where things get interesting. In questioning why this competitor had so many more likes that my Page, I noticed something astonishing and potentially quite revealing. Their most popular city was not just out of the country, it was from a place highly unlikely to generate that much discussion on the topic in question. My conclusion: It is highly probable the Page purchased these likes thus generating wildly skewed and somewhat deceiving results. Another insight that led me to this deduction was the page’s engagement. Despite having a similar amount of posts, engagement too is fairly similar. This tells me that a much smaller percentage of people are engaging with their Page in comparison to mine. A few weeks have passed and I’ve kept an eye on things. From South Africa to India, their “Most Popular City” eventually returned to the states. This tells me a few things. First, maybe they didn’t buy their Likes; maybe they just aren’t influencing their target demographic. This is entirely possible, based on a review of their wall. Or maybe they’re posts have poor timing. As Google and other search engines start placing more and more social proof into their page ranking consideration, seeing irrelevant Likes from overseas is likely to go the route of link building via guest blogging: Quality guest blogging is OK but guest blogging for SEO sake is not. Don’t be surprised if social proof re: Likes goes the same route in the very near future. For further reading, check out this article by Jon Loomer on why you shouldn’t buy Likes. It almost seems like old news, or maybe news that wasn’t: about a month ago Google sneakily rolled out its latest algorithm and search infrastructure update. 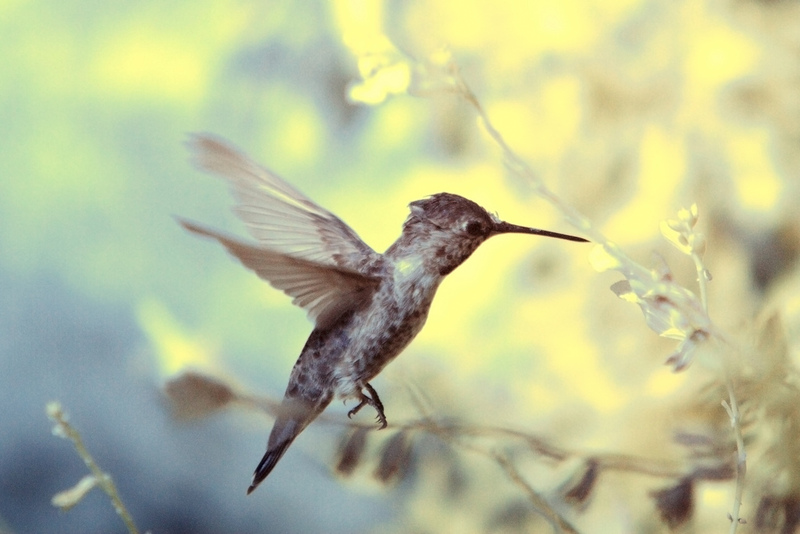 Last week they announced the occurrence at their 15th anniversary — the update has been dubbed Hummingbird. Within SEO, to me, there has always been a strong correlation between a few simple, common sense items and the production of good, quality content. Certainly, other, more complex items exist and are given weight — solid inbound links, site load time, certain elements of site build, etc. — but a page without quality, useful content is an irrelevant page. Reading between the lines in the MOZ article, I see Google doing a few things. First, and the article states this: Search is becoming more conversational, with results digging into the meaning and “semantics” behind the string. What this says to me is that posts, too, must become more conversational. From a content standpoint, it’s become even more important to develop a solid voice. I have always felt there is a strong correlation between content strategy and SEO. This gained appeal, perhaps most notably, after Google’s Panda release. With Hummingbird, the correlation is even stronger. The strategy behind building links to generate authority, increasing a page’s social capabilities, and creating quality content is becoming more and more important with each newly released algorithm update. In order to be a great leader, one must first learn to follow. Copyblogger: This blog features regular posts by a variety of writers on topics relating to content on the web. From content strategy to SEO copywriting to email marketing, Copyblogger is a must-read for anyone who creates online content. SEO MOZ: The Moz Blog is a great resource when it comes to staying up-to-date on all things related to SEO. The blog is a bit more on the technical and scientific side of SEO, so be prepared for that if you’re more on the creative side of things. A few other notables in search, content strategy and social that I recommend are , Mashable and ReadWrite. Above photo by fortherock on Flickr. The cat’s out of the bag. I am leaving my current employer and will be joining Vaughan Premier, parent of Lights for All Occasions and several other e-commerce sites, as Marketing Manager in just over a week’s time. While I’m sad to trade a 1.5 mile bike/walk commute for a thirty-mile drive one, I am looking forward to spending my time focusing on strategic marketing initiatives and heading up an in-house marketing team. Things I won’t miss: time entries and sorting through 100+ emails per day. Big picture marketing strategy. However, one area I am truly excited to focus my efforts is developing and implementing integrated content marketing strategies. And, to throw another buzz word in the mix, working with the CFO (who’s an analytics guru) to use big data to target these strategies. Earlier in the week, iMediaConnection posted an article about social media and online marketing trends for 2014. …top B2B content marketing strategies are articles on a company’s website, social media, e-newsletters, case studies, videos and articles on other websites. Marketing to the masses is becoming passé – it’s more effective to produce engaging content designed for specific audiences. I must say, I’m a bit passionate about content marketing. That’s to say I’m a bit passionate about CREATING strategic, targeted content with a purpose: achieving an end goal, something qualitative or quantitative, that impacts the bottom line for a business. This is an area I am sure will dominate my time at Vaughan. Blog posts, e-mail marketing, YouTube videos, social media. Maybe even some blogger outreach. And I can’t wait to join the team and get started. Jayson DeMers, SEO and online marketing guru and Forbes contributor, is the author of Forbes article “The Top 7 Online Marketing Trends That Will Dominate 2014”. Content marketing is a great way to demonstrate expertise in a field, relay knowledge about a subject, develop an audience and/or fan-base, and spread the word about your company. This is achieved through strategically generated and targeted content development. Alright, that sounds a lot more technical and difficult than it should. Think of it as crafting and spreading a core message across many channels. Essentially, it’s integrated marketing and communication, focused on the online world. Create a blog post (or posts) highlighting the product. This could be in the form of a list of hot-selling Halloween Units, an instructional post on how Halloween Units can make the day special for family, or something else that’s catchy, targeted, and interesting to the target audience. Above all, make the content useful and engaging to the target audience. Film videos showing off Halloween Units and post them to YouTube. Again, the strategy is in the idea behind the videos: make them interesting, make them funny, and just as important as the content… use appropriate keywords and titles! If you’re new to this arena, making videos for videos sake may be alright to get your feet wet. But you’ll want to quickly move on to making strategic, useful videos that people will actually want to watch, and better yet share! Take a few eye-catching photos, post ’em on Instagram and pin ’em on Pinterest. Number three on DeMers list is “Image-Centric Content Will Rule.” This is a no-brainer as photos have dominated social media for well over a year now. It’s what made Pinterest huge and led Facebook to purchase Instagram. Use striking photography to your advantage. And, again, title and tag it appropriately! Reach out to bloggers that may be interested in reviewing one of the products. Thanks to FensePost, I am on the receiving end of blogger outreach. Bloggers love free things; it’s one reason we blog. And getting through to the right blogger can help grow your audience by reaching theirs. This one is a bit trickier as it’s more a publicity/PR role, and therefore must be managed as such. Share all of the above across your other social media presences. That’s what integrated marketing is all about: a consistent message dispersed across multiple communication channels. If you’re already in multiple areas, why not take advantage of it!? And, of course, the opportunities extend beyond sharing from contests and coupons to strategically developed themed posts. You’ll want to develop a social media calendar to manage all of this (that’s a post for another day). For now, the above can act as a launching point to get your creative content juices flowing. Gmail recently announced and launched inbox tabs; it has been a core topic for email marketers of late. • Will this tab simply be a forgotten receptacle for promotional-based emails? • Could companies ultimately benefit in the long-run from the Promotion tab? • How will this change affect open rates, click rates, and ROI? These questions and more are being discussed. What remains consistent throughout, however, is a recommendation to inform email list subscribers of the changes and give them a choice (i.e. show them how) about where to house your emails. But what is the impact of these changes? 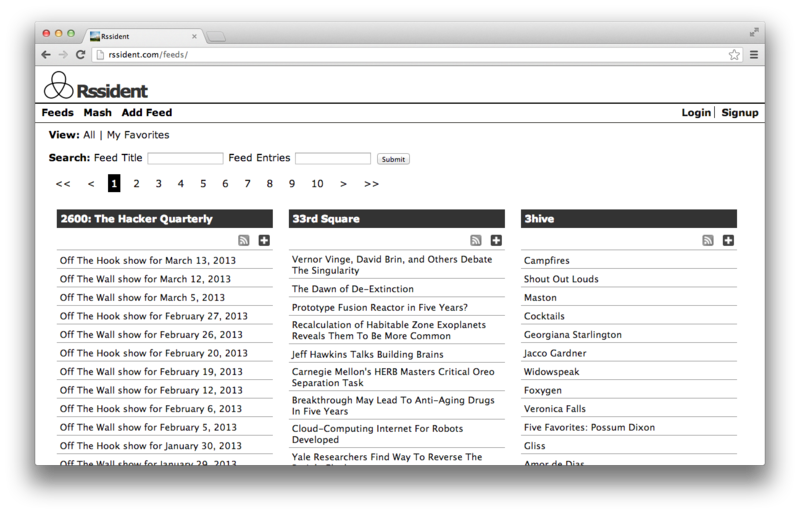 Mailchimp’s Matthew Grove took a look. 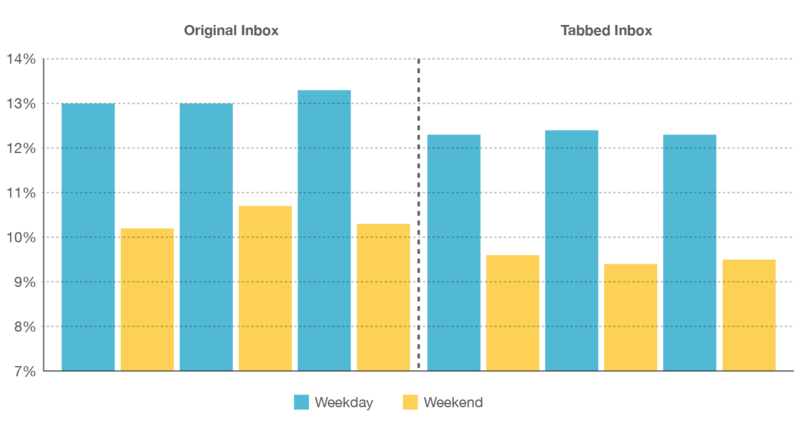 Late last month, Mailchimp gave us a rundown on how the new Tabs are affecting open rates. Like any good analyst, Grove took a large sample against which to compare the changes. By extracting Gmail delivery rates from the past year and a half, he compared it to data since the launch of the Promotions Tab. Grove notes the possibilities of error in his finding, rightfully stating that there are not only hourly but seasonal trends in delivery and open rates. He compensates for this error by using data from 1.5 billion emails. Before the tabbed layout, open rates to Gmail had been above 13% for 15 weeks. They never dipped below that threshold unless there was a specific holiday. For instance, weekday opens for Gmail fell to 12.5% on the week of Valentine’s day. Open rates between Christmas and New Years are an abysmal 10.5%… open rates (have since) stayed down for 3 consecutive weeks. A few percentage points drop is notable, but Grove isn’t too concerned yet — still, you can sure bet he and everyone else in email marketing will be keeping his/their eyes on the numbers. I’ve tested something like fifty configurations of headers, content, and authentication and I’ve come to one conclusion. The best way to get into the Primary tab is to have your subscribers put you there. 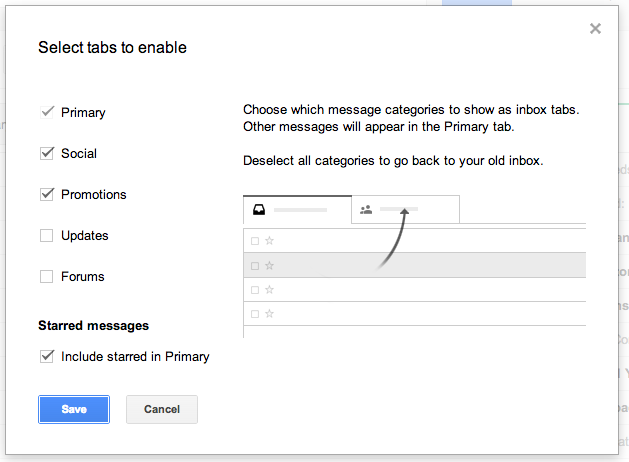 This is what email marketers are focusing on of late: how to clear Gmail contacts for display in Gmail’s Primary Inbox. Click “Yes” and all future messages from that email address will arrive in your Primary Inbox. It works the other way as well. Dragging a message from your Primary Inbox to Social, Promotions, or a custom tab will prompt you to store all future messages in the new location. Deselect the Tabs you don’t want to see and select the ones you want. It’s as simple as that. While I like the flexibility of the new Tab feature, I would love to see Gmail take it one step further and allow for customization, reclassification and renaming. So what’s the conclusion? The same as it has always been. 1. Supplement your email marketing by integrating it with other outreach methods: direct mail, social media, whatever makes sense for your business and — more importantly — your customers/audience. Maintain consistency in your branding and messaging; integrating your outreach will increase brand recognition and message recall in those who see it through multiple tools and tactics. 2. Make it meaty: ensure the content you distribute is high quality, engaging, enticing and has a viable call to action. Stories, images: these are both great to include in your outreach. You want your readers to remember you, so make sure your messaging is memorable. What people say about Facebook’s new Graph Search ranges from totally awesome to stalker-ish creepy. Articles have been published on how to use Graph Search to find a job. A Tumblr was created solely to show how revealing Actual Facebook Graph Searches can be. Today I sat down and gave the new search engine a little test drive. My thoughts: it hits all the above quite firmly. Now, some background. Last weekend, I took a little bike ride. Nothing too spectacular, just joined over 11,000 others on Group Health’s annual Seattle to Portland ride. Logged about 210 miles over the course of two days. This was my third time completing the journey, and once again I stayed with family friends at the midpoint in Centralia, WA. Contrary to other two years, 2013 saw R.O. and W.O. hosting a larger group; there were about 20 of us there. I met a wonderful couple named C.M. and M.O. We three connected several times on the road the second day, and verbal plans were made to connect in the near future. The only problem: we didn’t exchange contact information. Within 5 minutes, I had located both individuals on Facebook using Graph. Here’s how I did it. First I typed in his first name and his employer. This prompted me to click a search query for “People named ‘C.’ who work at ‘A. '” This yielded roughly 5 pages of results, none of which were C.M. No results. This means they haven’t made it official on Facebook. The results of this search far exceeded my interest to peruse them, so I took a different approach. Being that her first name is less common, it should have been my starting point. However, as I knew more information about him, that’s where I began. Searching with this query yielded a single page of results and she was in it. Visiting her list of friends, I was able to locate him quickly. These five steps took all of five minutes. Five minutes to locate people I know virtually nothing about outside of a few highly general facts. That’s scary accurate, a bit creepy, and — of course — totally awesome. Were I more observant, I could have narrowed the results in #3 by the “Refine This Search” column to the right of the original results. This allows you to specify options like Gender, Relationship, Employer, Current City, Hometown, School and many more. 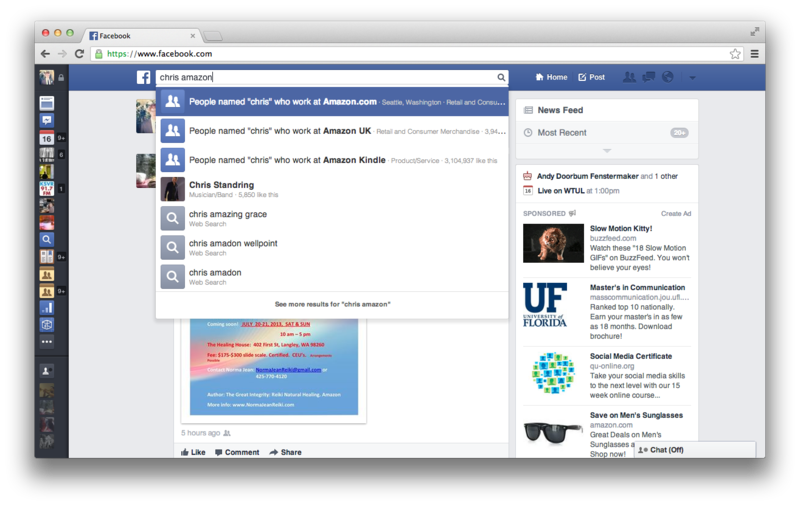 Yes, Facebook Graph Search is shaping up to be a bit of a game changer. With the quantity of information Facebook has logged on its users, it’s a bit surprising more people are up in arms about the NSA rather than shutting down their Facebook accounts. Still, it’s power is that of sheer awesomeness… and will be until something embarrassing about you inevitably gets exposed. I’m sure we all have one or two things we wish we hadn’t shared, said, commented or liked on Facebook. “It makes finding new things much easier, but you can only see what you could already view elsewhere on Facebook,” reads a Facebook press release. These days there are apps for everything, so I sat down and compiled a brief list of five must-have apps for the upcoming Seattle to Portland (STP) Bike Ride. This is not a new area; others have compiled bike app lists, including this The App Whisperer article that led me to choose my #1 app on this list. There’s also this Travelling Two article which goes beyond mere bike-only apps. 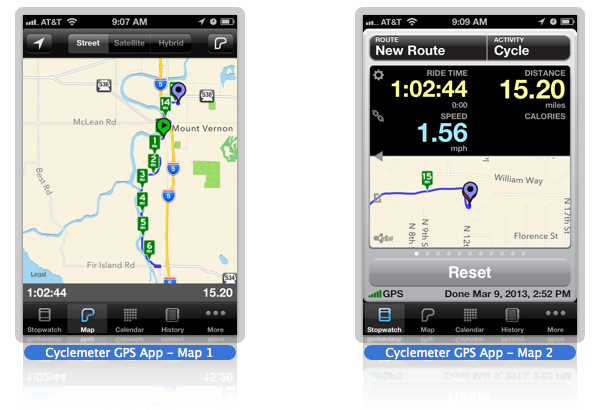 Read my original take on the Cyclemeter GPS Cycling App, and you’ll get the impression that I was a fan from the start. It’s true: I have used the app to track my location, elevation climbs, ride time and average speed since the day I purchased it, and I’ve found it very well worth the cost of a few dollars. My only complaint is likely the standard one: like most apps, continuous use over a long period of time will drain your battery. So, if you are able to charge while you ride either via a bike-powered phone charger (still looking for one that gets solid ratings) or a solar-powered phone charger (again, still on the hunt). If you prefer, you could also get Map My Ride, which has received good ratings. While the hope is you’ll never need it, having access to a bike repair or troubleshooting app can come in handy when out on the open road. This app gives you good step-by-step instructions on how to complete various small repairs and also has a decent troubleshooting section. In addition to my Bike Repair app, I have a small set of standard and compact bike tools housed just under my seat as a just-in-case. I have found the photo guides most useful and have used it to research removing pedals from my old 70s Schwinn Varsity. Bike Doctor is another app in this category. Again, the hope here is that you won’t need this app. However, there were a few times we passed cyclists who had crashed. Being that my father is both elderly and a diabetic, it’ll be useful to reference if he gets low/high on blood sugar during the ride. If an emergency should arise, this app could come in handy. Now, during the STP it is unlikely you’ll need this app even should there be an emergency or problem as this ride is quite well supported. However, if you are on a solo or very small group tour, it’s recommended to have a general first aid app. I love Instagram. It takes you standard, often dull camera phone photos and brings them to life. With Instagram, you can share your photos with your friends by connecting your account to Twitter, Facebook and Tumblr. A strong recommend for any trip and one I’ll be using frequently during the STP. Why use Yelp on the trip? During those overnight stays, Yelp is perfect for finding that hot local spot for a quick bite to eat, a beer after riding 100 miles, or even a hotel for the night (though for that I’d lean toward TripAdvisor or Orbitz). On a recent vacation, I used Yelp frequently to seek out restaurants with gluten-free options. You can read what others say in the reviews section. Its connection with Maps allows you to get easy directions to the dining establishment, and you can add in your own two-cents about your experience when you’re done. Earlier this past week, Yelp announced it had released a new tool for businesses to help assess and estimate how much revenue the site was helping them generate. One problem with social media has always been the difficult task of determining its return on investment (ROI). Thanks to Yelp, at least one social platform has taken step in an attempt to make calculating this an effortless task. This new FREE tool does the math by multiplying customer leads sent from Yelp each month by the business’s average revenue per customer lead. We’ve also included the average spend per customer for each business category for reference, based on the BCG study. In part, the tool “establishes a revenue baseline for prospective advertisers” – which is to encourage more businesses using the service to buy advertising. But this is a good thing; when a social company can demonstrate the value of its service, the value of its advertising, all while showing how both connect to the user’s ROI, well, it makes paying for that advertising all the more appealing. I’ve long been a fan of Yelp. It’s what I use to find hot spot eateries when I’m on the road or do not know the area. Whether, as a consumer-focused business owner, you use Yelp advertising or now, I at least encourage you to own and monitor your space. 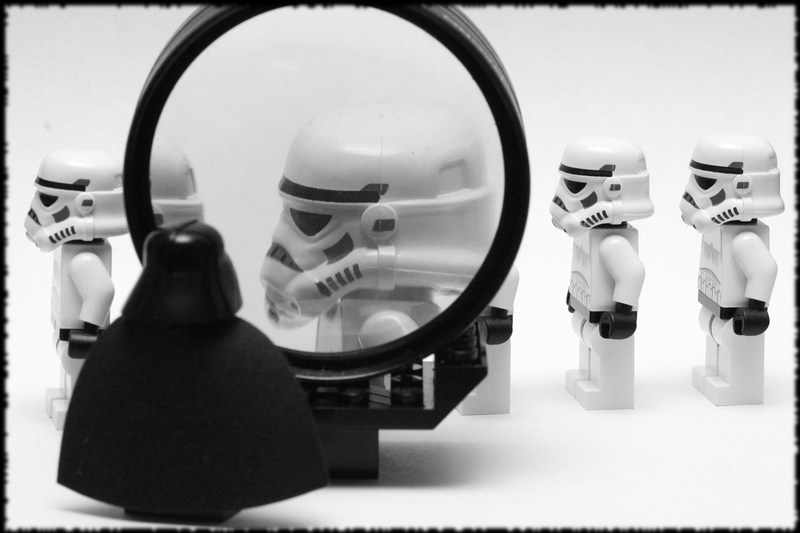 Keep an eye on reviews, understand how your customers see your business. Even before their Revenue Generating Tool, Yelp has provided a wealth of information for the small business owner that, when used strategically, can help that business grow, learn and become the best it can be. 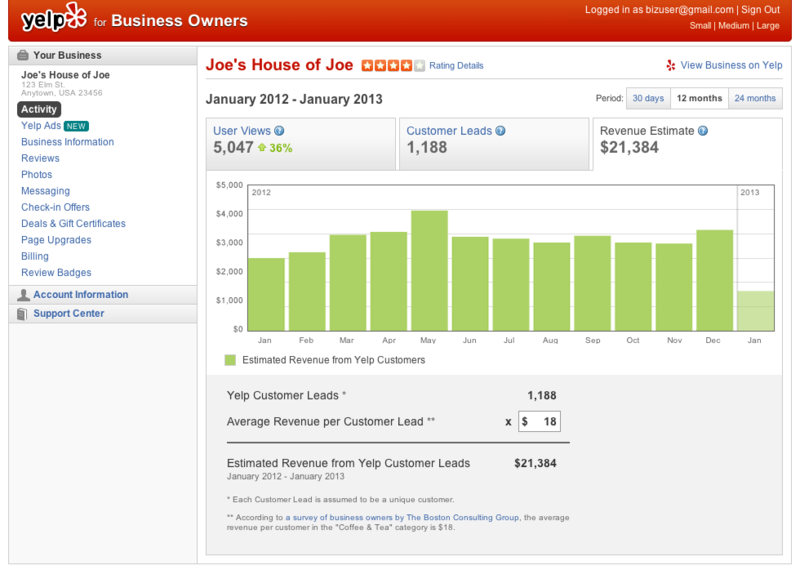 Check out Yelp’s Revenue Generating Tool by logging into you (or creating a) Yelp Business Account. 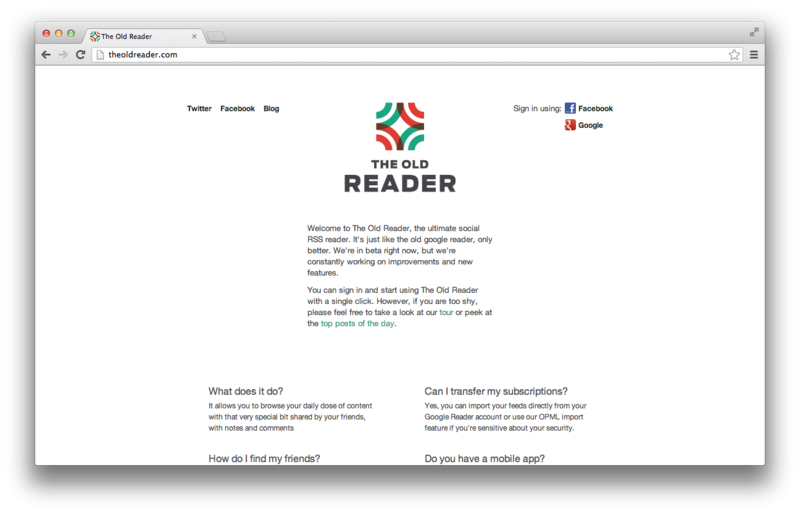 To the dismay of the Internets and Interwebs, it appears Google Reader is going the way of the indefinite hiatus. I’ve been noticing the complaints in my Facebook, Twitter and Google+ feeds over the past day, and amidst them was a list from my buddy Andy Boyan. This avalanche of GoogleReader DramaRama Saga is hilarious. 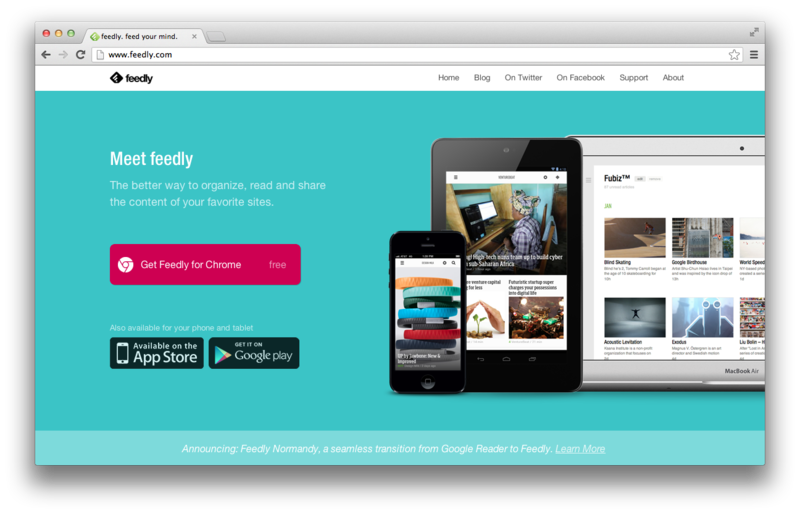 Congrats to all those RSS feed startups with brand new money and energy… Have you had any experience with these or other RSS Feed readers? …when you’re ready to make the jump, be sure to check out the Data Liberation Front’s primer on exporting your Reader data using Google Takeout. 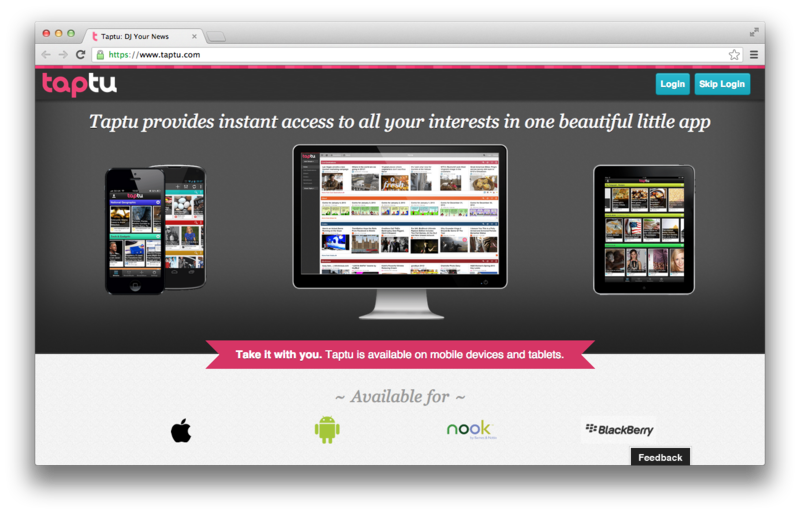 In related news, Mashable reports Digg is building an alternative to Google Reader as well. 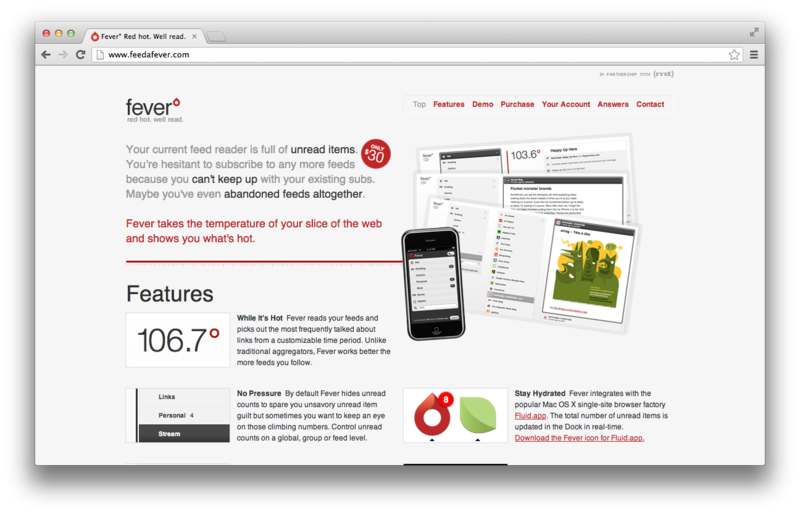 Do you use any of these feed readers? 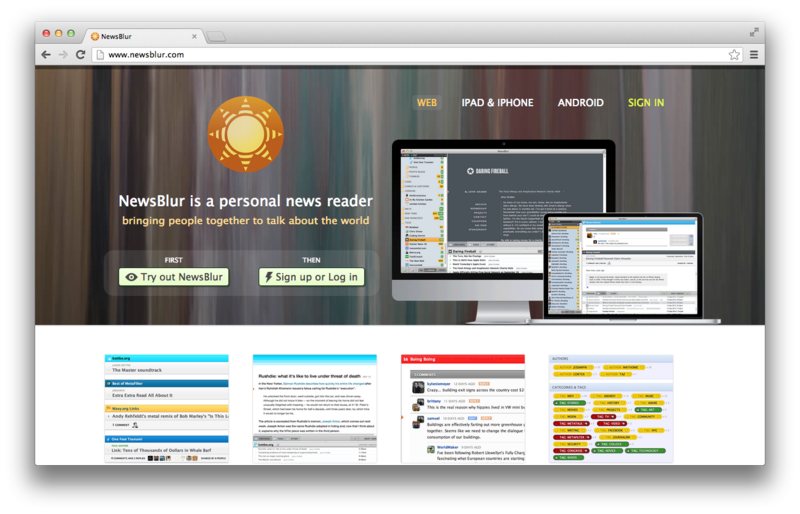 Are you a Google Reader devout looking for a new feed home? Let me know your thoughts and decision process in the comments section! WordPress is among the most widely used blog and content management system platforms in the world. Because of this, it’s easy to get sidetracked by the day-to-day and forget that new plugins are continually being created. Here are five must-have WordPress plugins that I highly recommend and have included on all my sites. These five plugins were chosen due to the diverse attributes they will lend to your site, from making it more sharable to enhancing it strategically, from visual fluidity to overall optimization. Essentially, when used properly they will help you inspect (hence the above photo by pasukaru76) your content and make it better while looking good. Whether you’re new to WordPress or an old pro, it’s always good to keep an eye out for new WordPress plugins. If you have a plugin recommendation, please share it in the comments and let us know why it’s so great. • Create analytical and statistical goals for your site and measure against them. 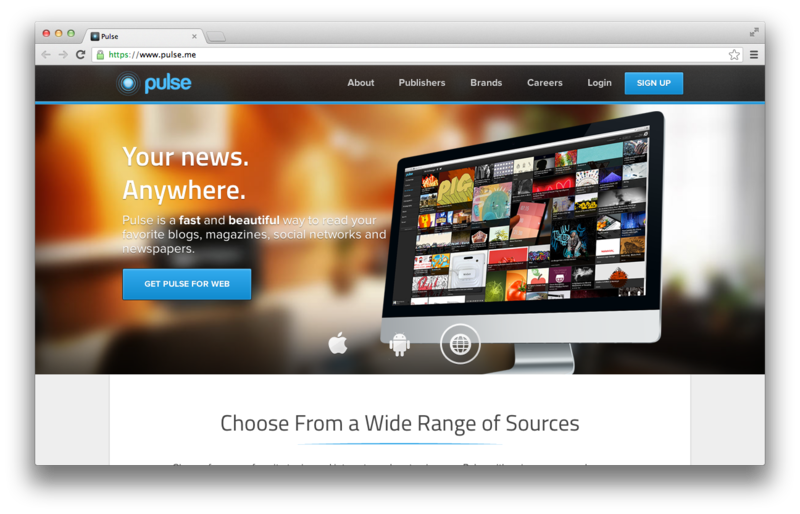 • Pinpoint your best content for promotion and in-site linking. • Gain insight into which articles draw traffic and produce similar content. If you’re not tracking and monitoring your analytics, you’ll soon be left behind. Grab the Google Analytics for WordPress plugin here. Jetpack has a hodgepodge of features that you can use to improve your site functionality, sharing capabilities, and more. There are pods that allow you to activate the infinite scroll, transform your image galleries into a large full-screen experience, automatically post to your social sites like Facebook and Twitter, and optimize your site for Mobile devices. Click here to download and install Jetpack by WordPress. WordPress SEO gives you added search engine optimization (SEO) capabilities by allowing you to manipulate your SEO title and meta description and more. While altering your meta description alone won’t likely help you rank higher, but it allows you to generate a proper description and may ultimately generate more clicks when it does show up in search. Learn more about the WordPress SEO plugin by visiting this link. This one has been a godsend. One of my biggest personal complaints with modifying existing WordPress themes, specifically on my blog FensePost, has been the problem of inconsistent image dimensions. Having a minor case of OCD when it comes to such things, it bugs me to no end that my early FensePost content has smaller images than the current posts as, over time, the content width has increased in size. Enter WP Fluid Images and this problem is solved for any future posts. While I cannot go back and manipulate the image size on photos I cropped in the early days, by adding a full-size photo to the site, WP Fluid Images scales it to the appropriate content width – and it’s variable to take advantage of responsive sites like this one nonetheless. A true must-have!!! Get the WP Fluid Images plugin here. I don’t use this one very often, but it does come in handy on occasion. If you’re looking to add audio or video content that is NOT uploaded to a sharable audio platform (like Soundcloud) or video platform (like YouTube or Vimeo), and instead plan to host the content yourself, MediaElement.js HTML5 Audio and Video allows you to easily embed the content in your WordPress post or page. 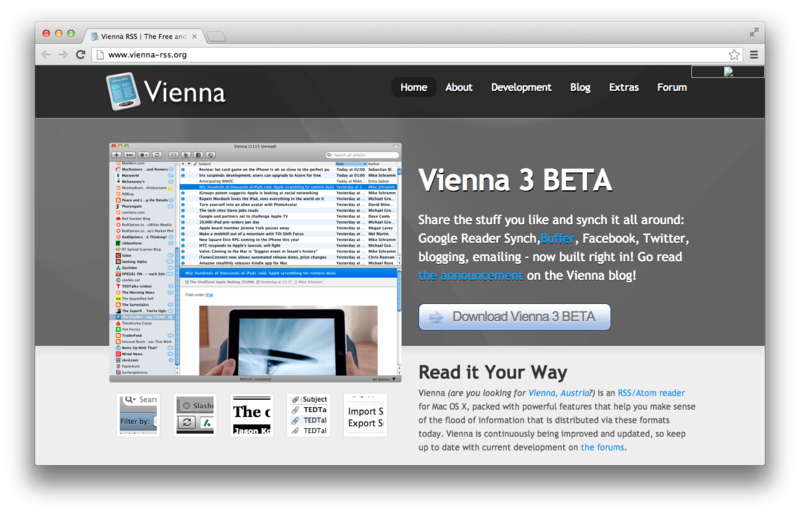 Highly recommended for the multimedia content developer/generator. This link is your key to embedding audio and video into your WordPress site via HTML5.